Furniture shopping just got affordable. Pepperfry Big Freedom Sale is here with craziest discounts on furniture, lamps, dining, carpets, cookware, Housekeeping, laundry and more. Get the hottest prices with Pepperfry Independence Day offers. Update: Here is a reason to cherish this festive season. Pepperfry Big Freedom sale is extended till 20 August. So you get some more time to shop around. Keep shopping to get up to 50% off on furniture, kitchen appliances and more. Thinking to renovate your home or kitchen? Do it on a budget with Independence day offers. 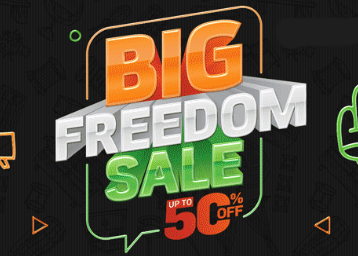 Pepperfry Big Freedom Sale is already live with up to 50% off across all categories. Save big on largest range of Furniture, Decor, Lamps, Furnishings and more. Also, enjoy no-cost EMI and easy returns with Pepperfry. With Independence day offers you don’t need to stress over the budget with big discounts coming your way that you can avail in some simple steps. Note: Pepperfry Offers Free Shipping on Minimum purchase of Rs 999. For your purchase, under the minimum value Rs 59 extra will be charged. The Pepperfry sale offers end on 13 August, so you have some time to think about your purchases. But keep in mind the stocks can run out fast as the prices drop. Shop during the sale period to make your purchases even more affordable. Pepperfry Independence Day offers give you up to 50% off on products across categories. You simply can’t afford to miss the offers if you are planning to buy furniture in the near future. Pepperfry Freedom Sale offers are easy to avail, you get all the mega discounts at one place. No need to scroll endless web pages, you have the hottest deals at one place. Avail Pepperfry Independence offers in simple steps. Visit Pepperfry offers Page from here. Next, login or Sign up on the website. Congrats! You just availed an amazing Deal. Note: Apply the coupon code "FREEDOM" to avail Pepperfry Big Freedom Sale special discounts. The coupon code is applicable on certain items across all categories. A wide range of products across categories makes Pepperfry the online destination to shop your favorite furniture items at a bargain price. Whether you want to purchase sofas, chairs, dining sets, dressing tables, wall shelves, or office furniture, you get everything under one roof. Pepperfry offers on furniture make your purchase affordable and help you save more. Starting adding products to cart and see the prices drop with use of Pepperfry coupons. This Independence day, Pepperfry has many deals on popular cookware and kitchen appliance brands. Frying pans, Saucepans, Tawas, spatulas, pressure cookers, electric cookers and baking tools all are selling at lowest prices. In addition to that, you can buy cooktops, chimneys, microwave ovens, blenders, and beverage makers. You also get the best of brands under one roof with Pepperfry. All the products are handpicked making it easier to pick the right one. Another popular category is hardware and electricals. In this, you get discounts on LED lights, CFL lights, Designer Fans, Pedestal Fans, Table Fans, Room heaters, Measuring tools and more. Once again the variety on display takes care of your needs as well as budget. With Independence day offers on Pepperfry, you get additional discounts which make your purchases even more pocket-friendly. Apart from furniture, you can shop rakhi gifts in Pepperfry Big Freedom sale. These product categories also get a major price drop during the offer duration. Both the prices as well as variety is simply mind-boggling. So, you can purchase Rakhi Gifts as well from Pepperfry in addition to furniture, electricals, cookware etc. Pepperfry offers today bring discounts on all types of products to make your purchases more affordable. While shopping on Pepperfry.com also look for the latest coupon codes as you can save more. It is easy to avail discounts with coupons as you just have to enter the code on order review page. After you want Pepperfry coupon click apply to redeem the discount on your purchase. The payment amount will be updated and you can complete the purchase by selecting any preferred mode of payment. Pepperfry supports a variety of payment modes include credit/debit cards, Internet banking, Wallet, EMI, and PayPal. Recently, PayPal announced its Indian footprint. Furniture shopping online is the new trend, it offers so many benefits to customers apart from a whole range of products on display. Online stores offer services like express delivery and free assembly. On top of that, the online offers on furniture are great to save some money. You get discounts on all types of branded and designer products. Consumers can shop anytime from the comforts of their home to get free delivery of furniture. The online deals on branded furniture items are unmissable, they offer great value for money. Use “FREEDOM” coupon code on your purchase to get extra discount. Pepperfry is popular for its wide catalog of furniture but you also shop wall lights, bed sheets, cookware, bottles, cushions and more. Check the Pepperfry offers today to shop at the lowest prices. You get fresh deals every day so you have a new reason to shop from the online store. Pepperfry WTF Deals bring amazing savings as well, in this section, you get products at throwaway prices. On the occasion of festivals, shopping is almost a must do which you simply can’t miss. And with Independence day offers you get the freedom to shop, thinking less about the budget. Shop your heart out as you are guaranteed to get the best prices. For furniture shopping, Pepperfry Independence sale offers make the task much simpler. Check the hottest offers of the online furniture sale. Pepperfry Big Freedom sale runs until 13 August where you can grab up to 50% off on furniture and more.